The name Hummingbird reflects many of the qualities of hummingbirds: very small size, highly mobile (they can fly in most any direction at will), and capable of long-distance travel (many migrate between South and North America). The Celestron Hummingbird is a “micro” ED spotting scope, and like its namesake, the Hummingbird Micro Spotting Scope is as well suited to long-distance travel as it is in the garden. Ideally suited for travel – the Hummingbird will easily fit in pocket, shoulder bag, or carry-on luggage. 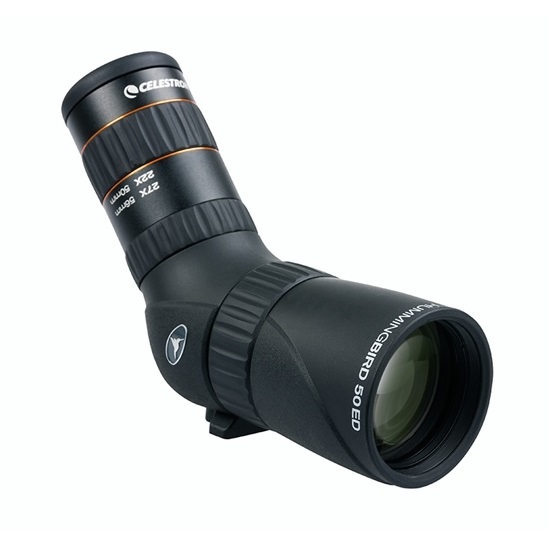 This spotting scope is perfect for travelling birders as a more travel-friendly alternative to a full-size spotting scope. The lowest magnification level can also serve as a substitute for a binocular. The Waterproof / Nitrogen filled construction of the Hummingbird keep it protected against wet weather, humid conditions, and other environmental challenges. The durable armour works to keep the Hummingbird protected against bumps and jolts both during transport and in the field.